1. Carefully push on the top edge of the mirror holder (A) by hand. 2. Put a shop towel in the opening between the bottom edge of the mirror holder and the mirror housing (B) to prevent scratches, insert a flat-tip screwdriver to the guide notches (C) of the mirror holder, and release the bottom hooks (D). 3. Apply heat with a heat gun to the gap between the mirror holder (A) and the mirror housing (B). Carefully pull out the bottom edge of the mirror holder to separate the adhesive (C), and then release the side hooks (D). NOTE* Do not heat the plastic parts too much or you may damage them. 4, Separate the mirror holder from the actuator (E) by releasing the hooks (F). if equipped, disconnect the mirror defogger connectors (G). 5. Before reinstalling the mirror holder to the inner holder actuator (A) on the actuator, check the actuator rods (B) and the actuator boots (C). NOTE: Make sure each actuator rod is inserted into the actuator securely, and each actuator boot is fully seated on the actuator. 6. If equipped, reconnect the mirror defogger connectors. 7. Reattach the hooks of the mirror holder to the actuator, then position the mirror holder on the actuator. Carefully push on the side hooks of the mirror holder until the mirror holder locks into place. 8. 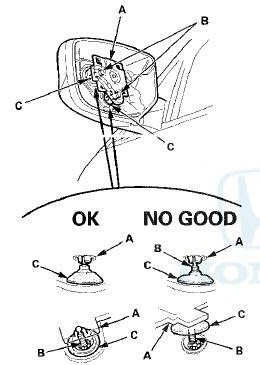 Check the actuator operation.